The 15th day of Chinese New Year is called Chap Goh Meh, also known as Chinese Valentine’s Day. It is a big deal here in Penang with events all over including a big gathering at the Esplanade in George Town hosted by the Penang State Government. Read more about what the holiday is about in last year’s post. Also visit the curated photo blog Living in Penang illustrated to see images from Instagram of the Chap Goh Meh celebrations. Find out why young singles are throwing mandarin oranges into the sea. This year I want to share one of the traditional dishes eaten during Chap Goh Meh, Bubur Cha Cha. Bubur Cha Cha is the name for a Nyonya dish that is sometimes confused with a similar dish called Pengat. It is a sweet dessert that is said to make the new year sweeter. The Cha Cha is supposed to sound like ‘che che’ which in Hokkien means ‘prosperity’ or ‘abundence’. This is a dish to be shared, so serve it to friends and neighbors today. It is also the last day to hand out those red envelopes. Children should be getting their last bit of loot before the river runs dry. 1 cup cubed yam, yellow and purple for more colors. Steam the yam and sweet potato. They should get soft but not mushy. If you don’t have a steamer, sprinkle with water and microwave for 10 minutes. Bring 1 cup of water and 1/2 a cup of sugar to a boil. Drop to a simmer and add the pandan leaves. Add 1 cup of coconut milk and simmer for 4 minutes. Add steamed sweet potato and yam, stir to coat. Serve over a heaping spoonful of sago pearls. 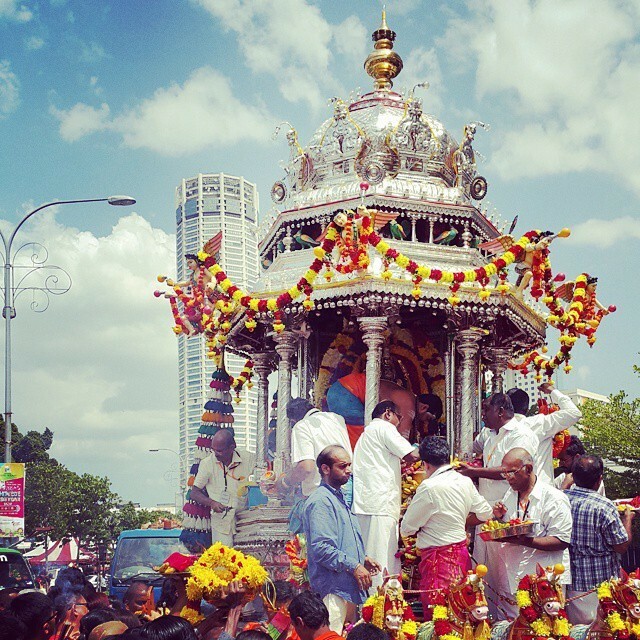 I’ve written about Thaipusam in the past on this blog. It’s a red-letter public holiday that is one of the Hindus’ most important days. It is a colorful festive display with most of the celebrations focused in four locations: Penang, Ipoh, Batu Caves in Selangor, and Singapore. 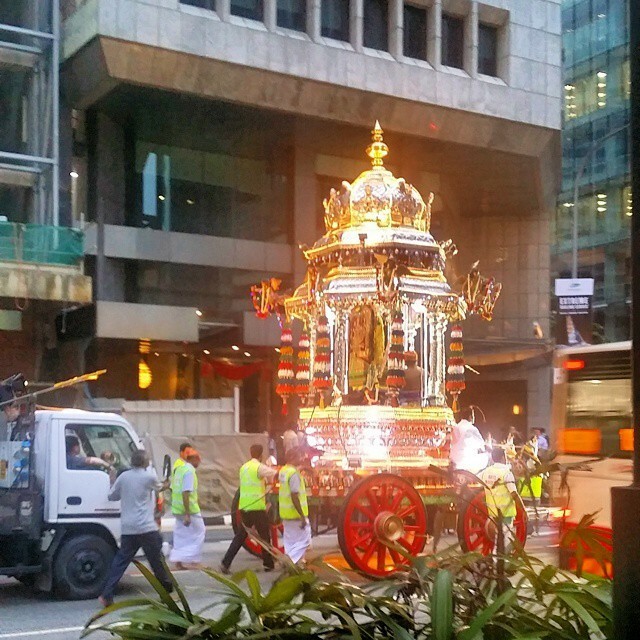 Thaipusam is a really big deal. It is also well captured on social media, especially Instagram. As a service to my readers, I’m curating the Thaipusam pictures that I’m finding on Instagram into a series on the Tumblr feed, livinginpenang-illustrated. 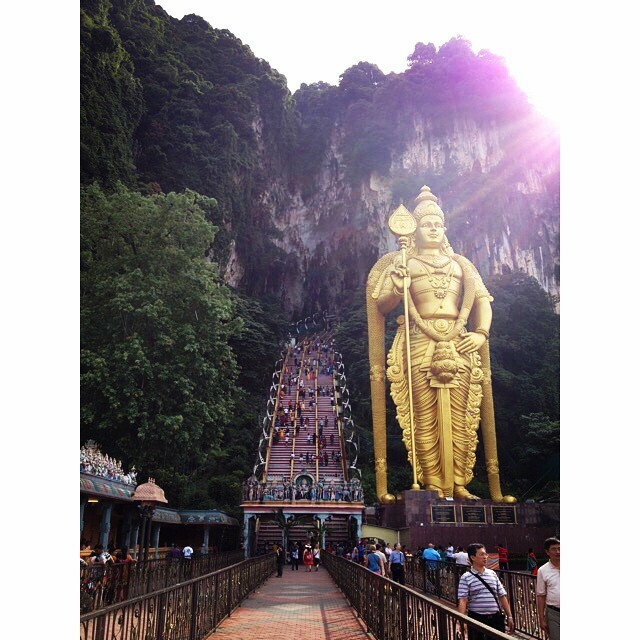 The Thaipusam pictures can be found under the hashtag #thaipusam. 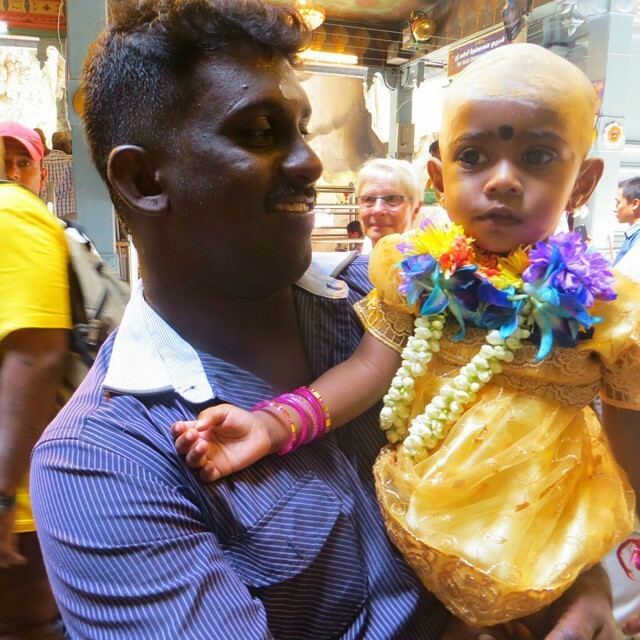 Find more images from Thaipusam on the Tumblr. When I was growing up, I wasn’t allowed to call things weird. Especially if I wrinkled up my nose and said it dripping with disdain. That was the case when the family would be invited to a large 12 course Chinese meal and the foods that were served passed beyond the normative range of an American Born Chinese kid. Picture a large platter of fresh sushi on ice with two lobster heads as the centerpiece. Now imagine a 14 year-old getting freaked out because the decapitated lobster head facing him just moved its eyes to watch me eat its flesh. My mother was quick to point out, the meat is “so fresh!” That just wasn’t good enough for me. Now the tables have turned and I’m the parent, and my children are the third culture kids. They are finding things new and different and weird in this land of Penang. There are new customs, new festivals and holidays, new foods. If you’re unfamiliar with the term, third culture kid, let me recommend the book Third Culture Kids: Growing Up Among Worlds by Pollack and Reken. A TCK is a person who grows up outside their parents’ home culture. Expat parents should get familiar with the challenges and benefits that comes with being a TCK. More resources below. But my point is, I’m having to hear from my kids that things are weird. I’m not entirely comfortable to say that they need to stop. I think we just need to redefine the term. Let’s take the wrongness out of weird. Let’s remove our egocentricity and see things from another perspective. And now we realize that weird can mean different, without being bad. An egocentric person would consider anything outside of my personal frame of normalcy to be wrong. With this simple tool of allowing for someone else’s normal we take the first step towards living cross-culturally successfully. We can go into these cross cultural situations and think, “that’s different, but I might like it.” You can also give yourself (and your children) permission not to like it as well. I’m finding that this new sense for the word weird to be freeing. We are now free to experience the weird and look at things that are different. We can keep our judgment to ourselves or to be discussed at home. Read at least one book about TCKs to familiarize yourself with the issues. Participate in a twice monthly twitter chat under the hashtag #TCKChat (1st and 3rd Wednesday, 10am and 10pm). For those of us in Penang that’s 11pm Wednesday or 11am Thursday. Send me a message @livinginpenang and I’ll show you how to participate in a twitter chat. Are you as excited as I am? The World Curry Festival will be coming to Penang Jan 30 to Feb 1, 2015. For the last 5 years this has been a British event. The aim was to establish Britain as one of the curry capitals of the world. It’s true too. Recently I hosted two families of Britons at my house, and as a joke I googled traditional British recipes. Chicken Tikka Masala came up as the third search result. For this 6th annual festival, they are taking it international, to Penang. Curries from everywhere, not just Malaysia, will be represented. It will be part of the Penang International Halal Expo and Conference. Where’d the Penang Durian season go? It really isn’t my fault. The information on the web, and even from locals on the street say that December used to be a Durian harvest. So I posted about Durian’s second season. An excited out of town friend sent me a WhatsApp message saying he was in town and read my post. He invited me to go get some. So my one daughter who enjoys Durian, and my friend, and I went into Balik Pulau looking for a Durian stand… and there were none. Chee Cheong Fun is also known as Steamed Noodle Roll. It hasn’t topped any list (that I’ve seen) of Penang foods to try. And yet it’s a yummy local favorite. My gluten-free expat friends love it because it’s a rice noodle dish that they can eat. So let’s explore what Chee Cheong Fun is.